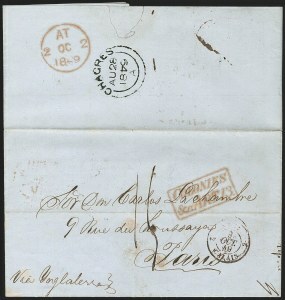 BRITISH POSTAL AGENCY, Colon, 1855 "Colon" Double-Arc Datestamp. 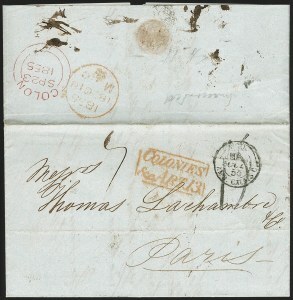 Folded letter datelined in Panama on Sept. 22, 1855 and addressed to Paris, France, bold red "Colon SP 23 1855" double-arc datestamp applied in transit on backflap, London and Calais transit, boxed red "Colonies & C. Art 13" accountancy handstamp, Very Fine, a scarce handstamp, fewer than half a dozen are recorded, Parmenter-Gordon "Rarity G, very rare"
VERY FINE STRIKE OF THIS RARE COLON CROWNED CIRCLE HANDSTAMP. IT IS BELIEVED LESS THAN HALF A DOZEN ARE KNOWN. VERY FINE. A TRULY REMARKBLE PAIR OF HISTORICAL COVERS. 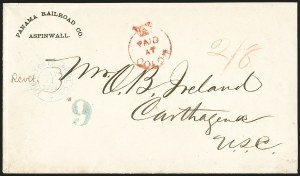 IDEAL FOR AN AWARD-WINNING EXHIBIT, HIGHLIGHTING THE PROCESSING OF MAIL THROUGH VARIOUS POSTAL SERVICES AND THE DETERMINATION OF A POSTMASTER TO FIND THE RECIPIENT, DESPITE HAVING BEEN POORLY ADDRESSED. 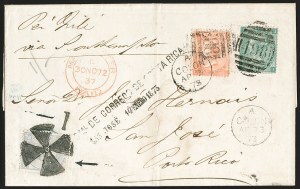 An even more thorough explanation of these two covers can be found in The Postal History of Costa Rica to 1883 by Frajola and Mayer. It is astonishing to note that these two covers still exist and have been reunited. In addition to the incredible story, the "E88" marking is exceptionally rare on cover with Paramenter-Gordon as "Rarity G, very rare". 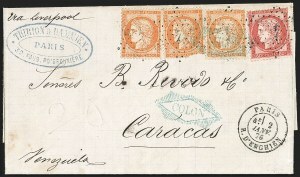 Oddly, off-cover cancels are known on various stamps which is not surprising due the importance of Colon as a transit hub, but less than a dozen on covers are known - certainly nothing as spectacular as this use.